CLEAN TITLE CERTIFIED! This vehicle is at 111 W 800 N Orem, UT 84057. White 2011 Chevrolet Avalanche. Leather, Sunroof, DVD, Navigation, Power seats and so much more!! A must see!! Reviews: * If you regularly pull a boat or trailer and also need the cargo capabilities of a pickup truck, along with abundant passenger space and comfort, remember that a properly-equipped Avalanche can tow up to 8,100 pounds (7,900 with 4WD.) With its versatile Midgate configuration, the 2011 Avalanche can be set up to carry long loads (including four-by-eight-foot plywood sheets) or, with rear seatbacks raised, to hold a full complement of passengers. Source: KBB.com * Versatile midgate-based body style; smooth ride; comfortable seating. 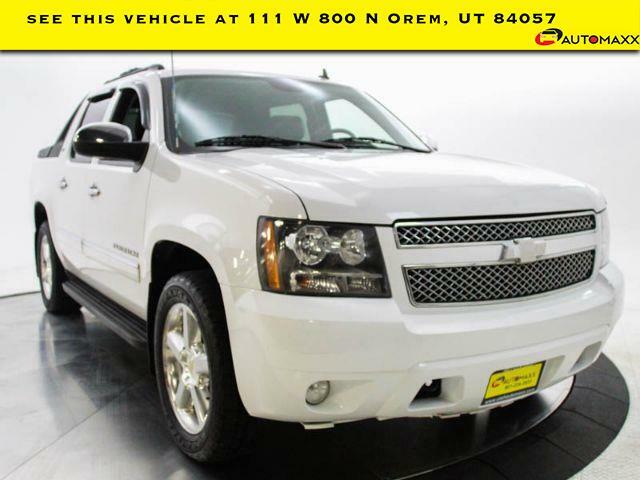 Source: Edmunds 2011 Chevrolet Avalanche 1500 LTZ --- All vehicles come with a 12 month/12,000 mile Powertrain WARRANTY for your PEACE of MIND! --- Winner of the 2018 and 2012 Quality Dealer Award in Utah and in business since 1998. ---Find us at 111 W 800 N Orem, UT 84057. Open 10am to 7pm Monday to Saturday. Or call 801-679-6688! !